After her fortune is squandered by her drunken gambler of a father, Catherine Davenport must accept the charity of a cousin she has never met. But the household of Phillip Davenport is anything but welcoming. Catherine barely survives a brutal attack that shatters her body and severs her memory. A harrowing rescue on the London docks takes her into the home of two brothers: Rian and Liam Connor. Mystery and scandal surround Rian, recently returned from a plantation in the Americas. As Catherine struggles to reclaim her identity, she must fight her overwhelming desire for the man who saved her life. But Rian, she learns, has come home for a wedding, and Catherine fears her enigmatic rescuer is already spoken for. How can a woman with no memory, no family, no home, hope to win the heart of London’s most intriguing rogue? Let me begin by saying that this story is part one in a series, and as such, the story does not conclude in this novel. It does however perfectly set up for the continuation of the story in books two and three. This was in interesting story on several levels. To begin with, it is definitely not your average historical novel. There is no way an unmarried young woman would be able to reside in the house of a bachelor without irreparably damaging her reputation and future prospects. The fact that Catherine stays there is bad enough, but things that happen during her fevered state complicate matters even more. However, these things are fairly easy to overlook, especially since this novel was so well done that I was drawn in from the beginning. 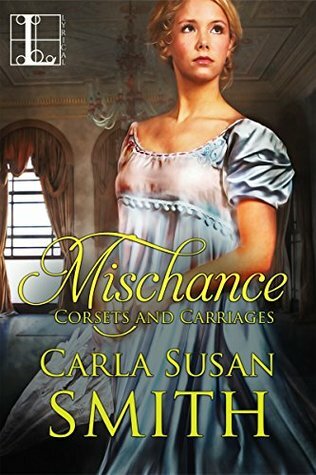 One of the most enjoyable aspects of Mischance was the fact that the author moves between different characters and their points of view, feelings, and actions. Rather than be confusing, I feel as though this approach actually brings a new depth to the story and makes for a greater enjoyment. We learn more about the characters by what they don't say, but rather what they think and how they act when others aren't looking. Speaking of the characters, each character in this story was well developed and brought something to the story. The brother's could not be more different, nor could the women we are introduced to. I have been drawn completely into this story, and I can't wait to see what happens next. I believe this story will definitely appeal to those who enjoy slightly unconventional historical romance novels. I would read more from this author!